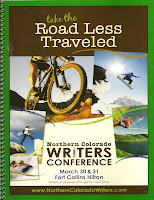 Kerrie and her team again provided a wonderful Northern Colorado Writer's Conference. I overheard nothing but good comments. Because of a busy writing schedule for the next few weeks, I've not taken the time to peruse my workshop notes but am anxious to do so before I forget everything. Choosing which workshops to attend proved difficult. I missed many good ones. But here, I share a few tips I learned from the workshops I attended. Tom Hess, editor of AAA's EnCompass travel magazine, looks for experiential articles. That means he wants no Google search information but information shared from the author's experience. His calendar is already set for the rest of 2012 and he now considers articles for 2013. Sandi Ault, author, required attendees to write tight. We wrote a five sentence scene which demonstrated some kind of change. Then, she insisted we change passive verbs to active. That was easy; my critique group knows I'll hack every passive verb. Readers of their five sentence examples revealed many excellent writers attended the conference. Laurie Macomber, social media expert, offered suggestions for improving one's social media experience. She also presented ways to write on your blog and website to increase SEO - exposure through keywords. I need to rewrite my website to take advantage of her ideas. Jim Davidson, author/climber, compared mountain to mountain climbing to the writer's journey in his keynote. An excellent presentation. Author Susan Skogg's effective book promotion explained partnering with supporters who have similar aims and goals. Search for blogs which might be interested in your message and guest post. In my case, that means teachers and moms. First develop a relationship then branch into sharing your message. Debbie Dadey offered her best advice for the business side of writing. Her fast-paced PowerPoint presentation talked about branding, record keeping, audits of royalties, promotion, and school visits, reminders of what every writer should do for their business. Listening to the first pages in the Slush Pile readings with Kate Testerman and Nicole Resciniti revealed how agents react to first pages and what a writer should include there. If everyone adheres to the agents' comments, more manuscripts will be accepted. Again, the pages showed a multitude of good writers. Kerrie's comparison of fly fishing to writing was a clever way to end the conference. My souvenir rock, as mentioned by Jenny in the last post, encouraged me to take the presenter's ideas and encouragement and "go write it." These are only a few offerings from outstanding editors, authors, and agents. If you can, plan to attend next year's conference. Another fringe benefit was being able to chat with presenters and agents from all over the U.S. at the meals and breaks. I sat with some NCW members and Steve Mettee at one break. During the conversation about Fort Collins, conferences in general, etc., I mentioned my website on words. Steve took the time to look at the site and email me a nice comment. I am going to do a blog post on something he mentioned as we chatted. Thanks for this additional information. I found most of the presenters willing to check out our blogs or websites. They also questioned us to learn more about us. Nicole offered encouragement about agent pitches and promotion. You are right Linda. By the way, this is Bob McDonnell. I made the first commment on this, but my name did not show. I recommend all writers attend conferences, workshops and seminars whenever possible. It's a great way to learn and network. Writers make the best support groups! My first conference and it was a great experience. 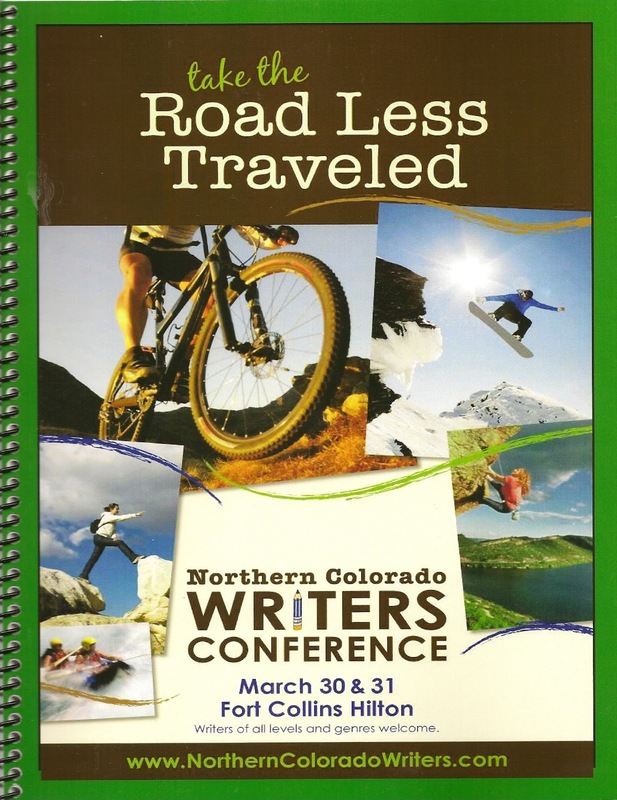 Great access to authors, agents, editors and NCW members everywhere. I got some great notes, personal advice and made many new friends...well at least I think so! Already looking forward to next year's event, and dreaming of attending one out of state sometime in the future...though I know it won't be nearly as great! I haven't had a chance to go through my notes and the conference booklet yet either, but that's on the agenda for next week. I found this year's conference better than ever...and I attended totally different workshops than you did. Pat, wish I could have attended every workshop. I agree. Best one I've been to. Great post Linda. Since I didn't really sit through any of the presentations (I am always too antsy to sit through one) I appreciate you sharing what you learned.